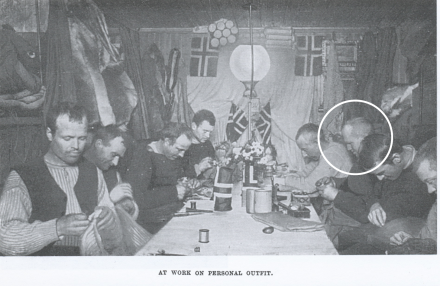 Amundsen's team working on personal kit during the winter before the trip South to the Pole. View a larger image. In order, from left to right, are Olav Bjaaland, Sverre Hassel, Oscar Wisting, Helmer Hanssen, Amundsen, Hjalmar Johansen, Kristian Prestrud, and Jørgen Stubberud. The circled gentleman is Hjalmar Johansen. Amundsen's first assault on the Pole in early spring was premature. Cold weather set in, and the party was forced to retreat. The retreat was disorderly, and nearly a disaster. Upon the return to base, Johansen publicly and heatedly attacked Amundsen, criticizing his leadership and decision-making. Amundsen, as leader of the expedition, was thus in two of the roles we identify here: he was the Target of abuse, and he was in the position analogous to what we are here calling Lead. Since Amundsen had no superior, Johansen had no alternative but to confront Amundsen directly, but he erred in making the confrontation both public and emotional. Amundsen subsequently "fired" Johansen from the expedition, in the sense that he assigned Johansen no further exploratory role. But Amundsen also modified his own approach to decision-making, at least with respect to choosing the start date for the assault on the Pole. In that sense, he acted as his own supervisor, putting himself on what we today would call a "performance improvement plan." Photo owned by the Norwegian National Library. It can be obtained from of the "Nansen-Amundsen-Year 2011" Web site, hosted by the Norwegian Polar Institute, developed by Paul-Inge Flakstad and edited by Janne Schreuder. This particular copy of the photo is from Amundsen's book about the expedition, The South Pole. In some meetings, we interrupt each other, we insult each other, we condescend to each other, and we can be bitingly sarcastic. Formally, it's the responsibility of the meeting lead or facilitator to deal with these behaviors. When they fail in these responsibilities, the abusive behavior likely continues or escalates. In these situations, there are at least four roles. The Aggressor initiates the abusive behavior. The Target is the object of the Aggressor. The Lead has formal responsibility for maintaining decorum. Bystanders are present, but in any given incident, they aren't Targets. Often, multiple people occupy these roles, and sometimes an individual might play more than one role. But for simplicity let's assume that each person plays only one role. And I'll assume, dear reader, that you've been either a Target or a Bystander. To end the abuse, Targets and uncomfortable Bystanders turn first to the Lead. Often, they learn that the issue is already being addressed. But what are their options if the Lead doesn't feel responsible for dealing with these issues? Or what if the Lead is unable to deal with the problem, because of incompetence or fear or whatever — what then? If abuse is part of the culture, dealing with each Aggressor individually is of little use, because there are so many other Aggressors. On the other hand, if the Aggressor's behavior is unusual in the organizational culture, progress is possible. I'll address the cultural problem in a future issue. For now, let's examine the case in which abuse isn't part of the cultural pattern. Let's suppose further that the Aggressors don't see their behavior as abusive, or if they do, they either don't care, or they haven't responded to private intervention. Now what? The guiding principle is Do No Harm. In this Part I, let's first address what you cannot do. In this scenario, the Aggressor's behavior is problematic, and the Lead is failing to address the problem of the Aggressor's behavior. Both failures are performance issues. is Do No Harmsupervisors can address performance issues effectively. Unless you're the Lead's supervisor or the Aggressor's supervisor, it isn't your responsibility to correct their performance issues. You can talk to the supervisor of the Lead, to the supervisor of the Aggressor, to your own supervisor, or to a Human Resources representative, but that's about it. It's up to them to address the performance issues. This picture might seem bleak. I'm offering no magic solutions to these performance issues. But it's important to recognize that dealing with performance issues is the responsibility of supervisors, not colleagues. If you try to insert yourself into the supervisor-subordinate relationship, you will most likely complicate the problem. Would you like to see your comments posted here? rbrenAmtFGzVAiRsmKyARner@ChacKlfzDzDxsmNsgtOroCanyon.comSend me your comments by email, or by Web form. See also Conflict Management and Emotions at Work for more related articles. I offer email and telephone coaching at both corporate and individual rates. Contact Rick for details at rbrenZPmkVCqugJiMSTTgner@ChacZhzfclwfgmsDIbnioCanyon.com or (650) 787-6475, or toll-free in the continental US at (866) 378-5470.